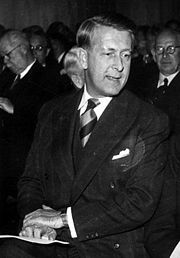 Bertil Ohlin (April 23, 1899 – August 3, 1979), was a Swedish economist and winner of the 1977 Nobel Memorial Prize in Economics. He began as a scholar, then wandered back and forth for a time across the boundary between the academic and political worlds, eventually becoming a full-time politician. His work on macroeconomics, with its use of such concepts as the propensity to consume, the liquidity preference and the multiplier, made him an important precursor of Keynes. Ohlin's name will, however, always remain associated with the standard mathematical model of international free trade, the Hecksher-Ohlin model. This theory, based on work with his colleague and former professor Eli Heckscher, states that countries naturally produce and export goods that make the most use of the factor of production in greatest abundance within the country. As such, it predicts a natural equilibration of the economic exchange between countries in harmony, allowing economic growth and subsequent prosperity for all. However, Ohlin and Heckscher, like many economists, did not fully understand the problem of selfishness in human nature which has to date prevented the emergence of such a world of peace and prosperity. Bertil Ohlin was born on April 23, 1899 into an upper-middle class family in a village in the south of Sweden. He received his B.A. from Lund University 1917. Having seen in a newspaper a review of a book about the economic aspects of the world war, The Continental System: An Economic Interpretation in 1918, a study of Napoleon’s blockade of England and its relation to the mercantilist system, written by Eli Heckscher who was professor at the Stockholm Business School, young Bertil Ohlin suggested to his parents, that he should take up studies there. This he did and, according his own autobiography, he was much stimulated by Heckscher's teaching. Later on, Ohlin moved to the philosophical faculty of Stockholm University where his teachers were Gustav Cassel and Gösta Bagge. During his studies in Sweden he spent few months in 1922 in Cambridge, England on a stipend from the Swedish-American Foundation and thereafter in Harvard University. After his return and a short, one year, stint serving as assistant secretary to the Economic Council under the chairmanship of the Minister of Finance, and another year serving in the Navy, Ohlin finished his studies and received his doctorate from Stockholm University in 1924. In 1925 he became a professor of economics at the University of Copenhagen. Throughout the next five years he reworked his Ph.D. thesis—that he had previously sent to Harvard University for publication—with the help of a editor-friend Carl Iversen into a ground-breaking publication (Olin 1933). In 1931 Bertil Ohlin succeeded Eli Heckscher, his teacher, as professor of economics, at the Stockholm School of Economics. In 1933, Olin published a work that made him world renowned, Interregional and International Trade. The book was characterized by an attempt to pay more attention to how factor supply reactions, location, taxation, social policy, and risk affect international division of labor. The static factor proportion model was only a beginning. Ohlin built an economic theory of international trade from earlier work by Heckscher and his own doctoral thesis. It is now known as the Heckscher-Ohlin model, one of the standard model economists use to debate trade theory. The model was a break-though because it showed how comparative advantage might relate to general features of a country's capital and labor, and how these features might change through time. It provided the basis for later work on the model to derive the Heckscher-Ohlin theorem, that nations would specialize in industries most able to utilize their mix of national resources efficiently. He was jointly awarded the Nobel Memorial Prize in Economics in 1977 together with the British economist James Meade "for their pathbreaking contribution to the theory of international trade and international capital movements." Today, the theory has been largely disproved, yet it is still a useful framework by which to understand international trade. Ohlin, a politician just as much as an eminent scholar, always made clear that he counted himself as one of the liberal camp even in his youth. The keystone of his liberal outlook, exactly as with Gustav Cassel and Heckscher, was the conviction that an economic system based on individual property rights and competition would foster high growth, and that, in the long run, growth was crucial to the development of prosperity. One of his expressed goals was, just as with Cassel, to “counteract economic superstition” (Ohlin 1972, 61-62, 184). Pursuing the political angle even more, he was party leader of the Liberal People's Party from 1944 to 1967, the main opposition party to the Social Democrat Governments of the era, and from 1944 to 1945 was minister of commerce in the wartime government. His daughter Anne Wibble, representing the same party, served as Minister of Finance in 1991-1994. Bertil Ohlin died on August 3, 1979, in Valadalen, Sweden. Starting from an article written by his old teacher, Eli Heckscher, Bertil Ohlin developed in three subsequent works—The Theory of Interregional Exchange (Ohlin’s licentiate in 1921, translated in 1999), The Theory of Trade (Ohlin's Ph.D. thesis in 1924, reissued in 1991) and his famous Interregional and International Trade (Ohlin 1933)—the thesis that both interregional and international trade are devices for the spatial exchange of the goods and services produced by factors of production. Since these factors themselves are to a greater or lesser extent incapable of being moved in space—land is the classic case of an immovable factor—in consequence of which, relative prices in different geographical locations depend on the relative scarcity of factor endowments in these locations. To put this in the language of modern trade theory: countries (or regions) will export commodities that are produced with their relatively abundant factors of production, and will import those that are produced with their relatively scarce factors, so that international trade tends towards an equalization of factor prices between trading nations, which is not to say that they will be equalized in practice. The effects of a difference in comparative costs are that some goods can be produced at a lower cost in one region than in the other, while the opposite applies to other goods. Thus, exchange will occur and each region can concentrate its production to the goods it can produce at the lowest cost (Ohlin, 1999, 9). The reason that the production costs for certain goods are lower in one region than in another is … the difference in the relative scarcity of factors of production. Since there is a relatively good supply of certain factors of production in A and their prices thus are low, the goods requiring a relatively large share of these factors of production can be produced at a low cost in that region compared to the types of goods requiring a relatively larger share of the more scarce factors of production. … Exports will then mainly consist of goods where the abundant factors of production are used in large quantities and the other factors in small quantities only, while imports consist of the types of goods requiring large quantities of the latter factors of production and factors of production not available in the region at all. … The exchange of goods is thus an exchange of factors of production, in the sense that goods ‘containing’ the relatively scarce factors are imported and goods ‘containing’ less scarce factors of production are exported. … The result is thus that the scarcity of factors of production is generally equalized. … There is thus a tendency that all regions get exactly the relative scarcity that would have existed, had there been no obstacle to the mobility of factors of production. In other words, interregional exchange tends to create a uniform price structure of the factors of production. (Ohlin 1999, 14-15). If goods as well as factors of production were perfectly mobile, the entire world would constitute an economic unit in the real sense of the word and the total supply of different factors of production would determine their relative scarcity. As mentioned, a free exchange of goods tends to give the same result and might also do so, under certain conditions (Ohlin 1999, 16). But a capital flow which is small relative to the capital stock of a country may be large relative to the trade flows. The need to equate prices of goods in the two countries converts into another equilibrium, where a larger or smaller number of the domestic goods fetch higher prices, so as to achieve a new equilibrium, in which the deficit in the trade balance will be exactly covered by capital imports. He goes on to describe changes in prices and utilization of factors of production as some industries increase and others decrease, and how changes in income and prices of goods will also incur a restructuring of consumption (Ohlin 1999). If there is increased demand for a commodity that requires much land, for example, wheat, and decreased demand for a commodity requiring much capital, such as fine cloth, the rise in the production of the former and the decline in output of the latter lead to an increase in land rents and a decrease in the rental on capital. It then becomes profitable to use more capital and less land in all production, including that of totally different products. This will free some land which can be transferred to wheat production (Ohlin, 1991, 112). There must be a specific relationship between (1) the technical characteristics of the goods and the factors of production, including the limited divisibility of the latter, (2) the supply of the factors of production, (3) the nature of demand … This relation must be such that at certain prices of the factors, common to all regions, there is a particular combination of industries in each region that uses the factors imprecisely the same proportions as they are supplied. As will be explored in greater detail in the following chapter, this condition can be satisfied only if there is an appropriate relationship between the three elements stated above, which must be considered to be given in the price determination problem (Ohlin, 1991). The advantages of producing a large quantity of a single commodity instead of a little of all commodities must lead to interregional trade … To demonstrate the importance of this, assume that a number of regions are isolated from each other, and that their factor endowments and their demand are so balanced that the relative prices of factors and commodities are everywhere the same. Under the [constant returns] assumptions of Chapter I, no trade is then possible. As a matter of fact, insofar as the market for some articles within each region is not large enough to permit the most efficient scale of production, division of trade and labor will be profitable. Each region will specialize on some of these articles and exchange them for the rest … The tendency toward specialization because of differences in factor endowments is reinforced by the advantages of large-scale production. The location of an industry in one region and not in another might simply be due to chance … The conclusion that interregional trade reduces the disadvantages of indivisibility corresponds to the previous conclusion that trade mitigates the disadvantages of an unequal geographical distribution of productive agents … Thus, all interregional trade, whether due to the one cause or the other, might be regarded as a substitute for geographical mobility of productive factors (Ohlin, 1933, Ch. 3). The Heckscher-Ohlin (H-O) Theorem, which is concluded from the Heckscher-Ohlin model of international trade, states that trade between countries is in proportion to their relative amounts of capital and labor. In countries with an abundance of capital, wage rates tend to be high; therefore, labor-intensive products such as textiles, simple electronics, and so forth, are more costly to produce internally. In contrast, capital-intensive products, like automobiles, chemicals, and the like are relatively less costly to produce internally. The two goods produced either require relatively more capital or relatively more labor. Wassily Leontief made a study that seemed to invalidate the H-O theory. He noted that the United States had a lot of capital; therefore, it should export capital-intensive products and import labor-intensive products. Instead, he found that it exported products that used more labor than the products it imported. This finding is known as the Leontief paradox. However, Leontief's explanation was that the workers in the U.S. have a lot of knowledge. In other words, the U.S. exports the goods that require a production factor that the U.S. is particularly well-endowed with, namely knowledge. One could say that the U.S. invested capital in the workers' education and skills. Thus, Leontief's explanation was consistent with the Heckscher-Ohlin theory. Additionally, of much greater practical importance—for example to the countries admitted to European Union from Eastern Europe such as the Czech Republic, Hungary, and Poland—is the question if, in a Heckscher-Ohlin Theorem world where the import-competing industries are relatively capital-intensive, trade liberalization will put downward pressure on the remuneration of capital; which will reflect factor-price equalization rather than the elimination of anti-competitive practices. Ohlin claims "trade tends to equalize factor prices, but this will be incomplete, in general, because of indivisibilities of factors (economies of scale)." That is, here the emphasis is on indivisibility as a barrier to factor price equalization, not just as a cause of trade (Flam-Flanders, 1991). And, again, "in the absence of transportation costs, increasing returns will be exploited to the full, leading to specialization in production between regions and, presumably, to unequal factor prices" (ibid. 1991). Then, the type of trade that may and can bring competitive discipline on domestic producers is, above all, intra-industry trade, which is a part of Heckscher-Ohlin trade hypothesis that strengthens regional specialization. Thus, the mechanism of implicit lowering the average cost-margin of a certain industry should be expected to work primarily in industries where intra-industry trade is substantial. But this might be regarded also as a first step into a capital-intensive international intra-industry competition that will come later. It is obvious that in the case of the Eastern European and South East Asia economies, relatively low wage costs—compared to those in the EU and the Western world—have induced some degree of specialization in labor-intensive industries (Neven, 1995). In this case, the industries (the classic examples are China and South-East Asia products; and the whole model of “outsourcing” and "globalization" based on it) are, indeed, very competitive even to the Western labor-intensive industries. EXAMPLE: Outsourcing of most, not just production-lines for chips and other parts for computer industry—indeed the complete assembly of computer and other hi-tech electronic production to China, Taiwan, Philippines and so forth—but also the whole software engineering to countries like India, the cheap-labor-intensive industries changed the whole landscape of the computer industry. However, consequent to Heckscher-Ohlin trade, the restructured and downsized capital-intensive industries in the same developing countries, were—independently of comparative advantage considerations—characterized also by large-scale managerial inefficiencies. Moreover, in some of these, mostly former Council for Mutual Economic Assistance (COMECON) countries, a long legacy not only of monopoly, but also of state ownership and central planning, is likely to make the reduction of productive inefficiency a significant part of the restructuring process. This process by itself would have tended to reduce the remuneration of capital, irrespective of any anti-competitive behavior prior to the trade liberalization process set up by the Europe Agreements. But once the trade barriers fell, all these reasons lead to the intra-industry competition for eventual export monopoly, based on the much cheaper labor, started. After this, comes the second round in which the Western capital-intensive industries are buying the indigenous industries that came up the best in the first-round (i.e., nation-wide) intra-industry competition. With the Western management, low labor cost and the existing high labor know-how, they can easily beat any international competition from any Western country. EXAMPLE: The Czech-based Skoda car-maker—with 80 years of experience in car producing and winning the "national stakes" among competing automakers—after having been bought by the German Volkswagen, has become one of the most sought-after car maker in the twenty-first century in the whole Continental Europe and Great Britain with huge inroads even in the U.S. market. So what may appear as a weak variation of margins may in fact reflect the countervailing influence of increases in price efficiency (lower price at constant costs) and increases in productive efficiency (lower costs at constant prices). Bertil Ohlin enjoyed a brilliant academic career, being professor of economics at the University of Copenhagen by his 26th year. A decade later he began an astounding political career. For 23 years he was head of the Liberal Party (folkpartiet) and an almost indefatigable contender against the Social Democrats, whom he never was able, however, to defeat in an election. Ohlin’s transition from scholar to politician seems to have taken place simply and elegantly; and, scarcely unexpectedly. It may well have been relatively painless to begin with: Ohlin, as an independent thinker, presented ideas about what a liberal party ought to be doing, whereupon the party approached him with the request that he put his ideas into effect on its behalf. But conflicts must still have arisen sooner or later between the independent thinker and a political party’s need for troops and tactics. Ohlin felt a calling to serve the public, which may perhaps explain why he donned the political mantle instead of continuing to develop as a theoretician, even though theoreticians also serve the public if their ideas can be translated into practical applications or if they can expunge ideas which ought not to be put into practice. "One problem which I addressed early on," he writes, "was whether one ought to strive primarily to be useful, to perform services for the public by one’s work. Or ought one to seek to develop oneself?" (Ohlin 1972, 97). He chose the former alternative. To sum up a personal reaction: It has not been easy to combine scientific work, teaching, journalistic writing and political leadership. All of these types of activity have no doubt suffered from my attempts to do too many things at the same time. However, I have found it all to be a fascinating business. Apart from his extraordinary political career, Ohlin's view of the role of increasing returns in trade (see Ohlin 1933, Ch. 3) and the fact that this view remained hidden in plain sight for nearly 50 years is astonishing. In the late 1970s, few trade theorists thought of increasing returns as a potential independent source of trade, and they tended to think of its welfare implications as a threat to rather than a reinforcement of the argument for gains from trade. Hence, Bertil Ohlin was one of the founding figures of modern international trade theory, and one of the prime movers in twentieth century economics. A leading member of the Stockholm School, he was a student of Eli Heckscher and Gustav Cassel. His work on macroeconomics, with its use of such concepts as the propensity to consume, the liquidity preference and the multiplier, made him an important precursor of Keynes. However it is his work in international trade which has yielded the most significant legacy. This was most fully expressed in his 1933 work Interregional and International Trade and has been immortalized thereafter as Hecksher-Ohlin Trade Theory and the Heckscher-Ohlin Theorem entered almost immediately into the textbook literature. Ohlin, Bertil. 1921. "The Equilibrium Rate of Exchange" in Ekon Tidsk. Ohlin, Bertil. 1927. "Ist eine Modernisierung der Aussenhandelstheorie erforderlich?" in WWA. Ohlin, Bertil. 1928. "Equilibrium in International Trade" in QJE. Ohlin, Bertil. 1929. "The Reparation Problem: A discussion" in EJ. Ohlin, Bertil. 1930. "Die Beziehung zwischen internationalen Handel und internazionalen Bewegungen von Kapital und Arbeit" in ZfN. Ohlin, Bertil. 1930. "The German Reparations Problem" in Ekon Tidsk. Ohlin, Bertil. 1931. "Protection and Non-Competing Groups" in WWA. Ohlin, Bertil. 1937. "Mechanisms and Objectives of Exchange Controls" in AER. Ohlin, Bertil. 1991. "The Theory of Trade" in Heckscher-Ohlin Trade Theory. Cambridge, MA: The MIT Press. Ohlin, Bertil. 1992. "Autobiography" in Nobel Lectures, Economics 1969-1980. Editor Assar Lindbeck, Singapore: World Scientific Publishing Co.
Ohlin, Bertil. 1999. "The Theory of Interregional Exchange" in Institute for International Economic Studies. Stockholm University. Cassel, Gustav. 1918. Theoretische Sozialökonomie. Leipzig: C. F. Winter. (in German). Neven, Damien & Paul Seabright. 1995. "European industrial policy: the Airbus case." in IDEAS online journal  University of Connecticut. Retrieved March 20, 2008.